Recently the press has been buzzing about an erroneous Consumer Alert issued by the CPSC stating that water balls are deadly dangerous and they see no way to fix the problem. The report is based upon the fears that a child inside the balls can suffocate because there is no way to exit the balls and there is no source of fresh air. The truth is that if a child was to have an escape hatch, they would then be in danger of drowning. It is the old adage of what is worse, the frying pan or the fire. As far a suffocating, fresh air is pumped into the balls every 5 minutes when the riders are changed. Charles Jones of Italy developed the balls and in his 14 years he has never heard of a death from suffocation or drowning and calls the water ball ride the safest water activity in existence for young children and supports his claim with a perfect safety record. The only case of a child being rescued and paramedics called was when the child had a pre-existing condition leading up to the incident. 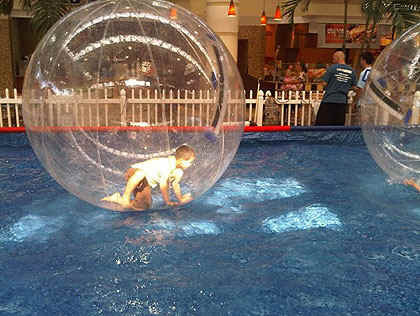 The parents should have read the warning signs posted and not allowed the child to ride the water balls. Every carnival ride from roller coasters to ferris wheel lock the people in so they do not try to escape and cause harm to themselves while the ride is in operation. And certainly if a careless operator was to leave a child in a ferris wheel over night, he would be exposed to the environment and probably try to climb down and get injured or killed. With Water Balls, there is a Pool Guard inside the pool at all times watching the children for anxiety and stress and if a problem occurs, the child can be removed in 30 seconds. Today's water ball operators have eliminated every risk involved in water ball. Water balls are the safest water activity available for children today. They never get wet and it is impossible to drown. So where is the CPSC coming from with their consumer alert? If you read the web site for the Consumer Product Safety Commission, they openly state that the "CPSC does not have the resources to investigate the accuracy of every report or comment submitted for inclusion on SaferProducts.com." Furthermore, "The CPSC does not guarantee the accuracy, completeness, or adequacy of the contents of SaferProducts.com, particularly with respect to information submitted by persons outside of the CPSC". Apparently they do not review the accuracy of information generated within the CPSC either?